The central parts of our Galaxy, the Milky Way, as observed in the near-infrared with the NACO instrument on ESO's Very Large Telescope. 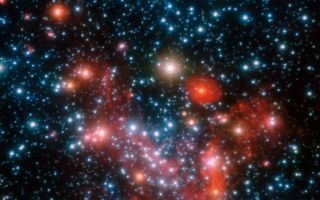 This space wallpaper shows the central parts of our Galaxy, the Milky Way, as observed in the near-infrared with the NACO instrument on ESO's Very Large Telescope. By following the motions of the most central stars over more than 16 years, astronomers were able to determine the mass of the supermassive black hole that lurks there.